So many quoteables in here. 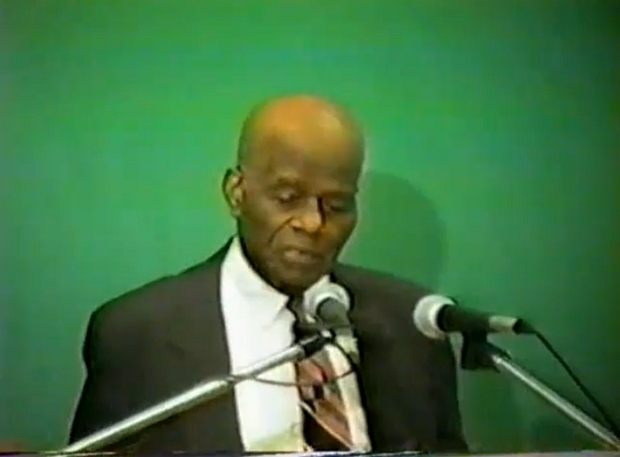 Dr. Clarke touches on the legacy of Cheikh Anta Diop ("the finest single mind produced in Africa in the 20th century"), the failure of black people to protect that legacy, the first concept of humanity via Africa, the imprisonment of the mind as a crime greater than the middle passage, the failure of modern African nations to practice African concepts (ex. "the professional thinker"), foreigners-fakers-and-fools, the "dual-rightness" of Frederick Douglass and his opposition as well as Booker T. Washington and W.E.B. DuBois ("you don't necessarily have to have a bad guy ... your American-movie mind won't let you deal with two 'rights' in conflict"), religion and spirituality and the oneness of God (Diop comes from the people who articulated "the oneness of God, without using the word God ... the word 'God' is unAfrican, organized religion is unAfrican ... mass spirituality was never supposed to be organized into something called religion ... I don't know a single form of organized religion that hasn't participated in some form of slavery and servitude"), gender roles ("the greatest respect was paid to the mother"), African development ("internal trade ... a highway system ... you got a panAfrican nationalist answer or you got no answer at all"). "Our true liberation will come when we look into a mirror and like what we see, when we value ourselves well enough to cater to ourselves."